Welcome to the corner of Broadband Genie dedicated to the Sky Complete bundle, more of which you can find out about below. We’ll cover all that this top-of-the-line bundle has to offer, from movies to sports to box sets and content both on demand and on the go. Whether you’re looking for just Sky Complete, or a bundle involving adding broadband, we’ve got you covered. In our comparison tables you’ll find all the latest deals and offers available direct from Sky, which you can compare the way that’s best for you: whether by channels or added extras – or broadband speed, price or contract length. At Broadband Genie we try and make the process of buying or switching TV and broadband deals as painless as possible. He have a host of guides and information available, while a simple click will take you directly to the offer you need on Sky’s official website. And if you find the whole process overwhelming, you can simply give us a call and we’ll guide you through it. What is the Sky Complete Bundle? If you love sitting in front of the box – whether it be for sports, movies, or your favourite TV shows – there’s no better choice than the Sky Complete Bundle. It’s the package that does exactly what it says on the tin, bringing you the best television experience Sky has to offer in the UK: there really is no comparison. What's included with the Sky Complete Bundle? The prices for Sky’s Complete bundle deals (you can of course add Sky broadband for extra savings and convenience) include all of its TV channels, which gives you more than 20 Sky Sports and Sky Cinema channels alone. And let’s not forget Sky Atlantic, Sky 1 and Sky Living – channels home to some of the UK’s most popular entertainment shows. Sky Sports has more live Premier League games than anyone else (126 in the 2016-17 season), alongside unrivalled coverage of a host of popular sports including Formula 1, international cricket and golf. While with Sky Cinema you can enjoy pop-up channels dedicated to everything from Disney classics to Star Wars, alongside dedicated thriller, romance, action and family channels. But it’s not just about live TV. You’ll also have access to more than 350 box sets on demand, as well as more than 1,000 movies on demand. When you compare the various film streaming services out there, you won’t find one that offers more of the biggest blockbusters first. Of course, it isn’t cheap. If you are looking for Sky’s cheapest offers, you’ll want to instead buy the Sky Original bundle: you can always add sports and movies later if you review how much you want to spend on your couch and popcorn-based habits! Does my Sky Complete Bundle include any extras? 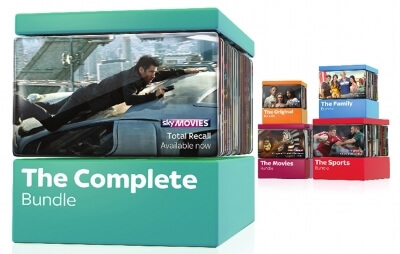 Sky Complete Bundle deals are a complete package, offering unrivalled extras alongside the actual shows, movies and sports. The Sky Q box comes as standard, allowing you access to 70+ HD channels and giving you hundreds of hours of storage, as well as access to catch up TV and the Sky Store – and it also has built in Wi-Fi so you can connect it directly to your broadband. You can even pause live TV. If you want to upgrade, you can add Sky Multiscreen (letting you watch shows around the house from a single Sky subscription). But Sky deals aren’t just about sitting at home and watching TV. The free Sky Go app (available on Apple and Android smartphones and tablets, as well as laptops and PC) lets you watch many of your favourite shows when you’re on the go, both live and on demand. Or upgrade to Sky Go Extra to download shows via Wi-Fi and watch them anytime. And then there are the Sky Sports and Sky Kids apps, giving you even more entertainment on demand. And don’t forget you can add unlimited broadband to the deal, putting all your home entertainment needs into one bill for added convenience.